Hello friends. I hope you are having a wonderful day! I am back today with a new skin care video and giveaway! 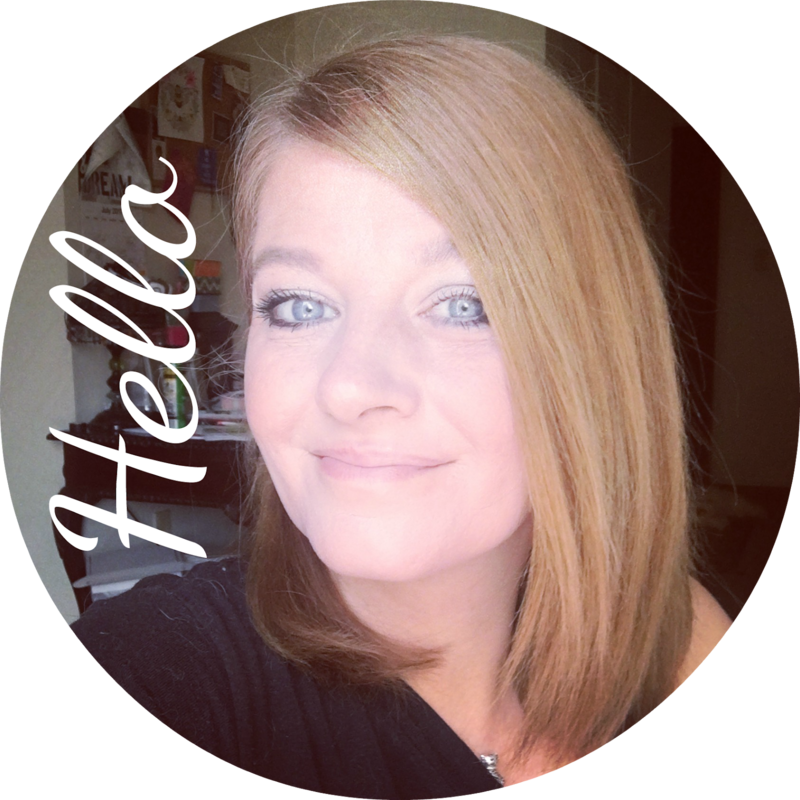 Recently I was contacted to try out 3 new DermaSilk products and I couldn't say no! 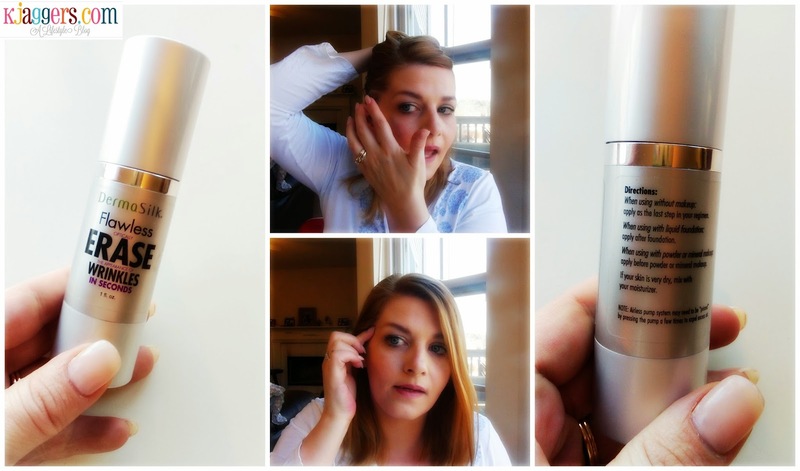 A couple years ago I reviewed the DermaSilk Night Time Face Lift that I really enjoyed using. I enjoyed it so much that I have bought it more than 3x since. :) So you know I had to say yes when asked to try out the DermaSilk 90 Second Eye Life, 5 Minute Face Lift, and the DermaSilk Flawless. You can see everything in the video and below is more pictures, information and the giveaway form. Hope you enjoy! 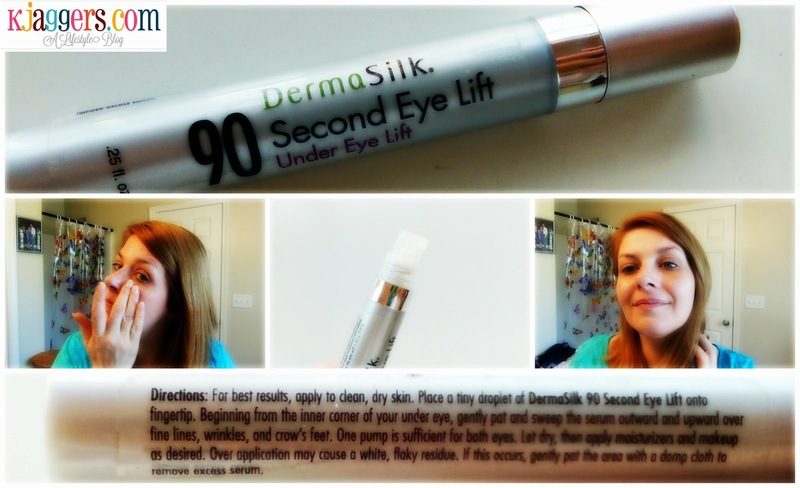 So the first item they sent me to try out was the DermaSilk 90 Second Eye Lift. With this product you apply it to clean dry makeup free skin. One pump is enough for both eyes. You apply it in a upward motion over your fine lines. wrinkles and crows feet. This formula claims to significantly tighten the skin around your eye area, reduce puffiness and lighten dark under eye circles. When I used it for the first time it was extremely tightening and felt amazing. I don't know why I love that feeling but I do! When using this the appearance of fine lines and wrinkles fades along with those crow feet that we all hate. I felt a difference right away and within about a minute you could tell that the fine lines around my eyes were less visible as were the crow's feet. 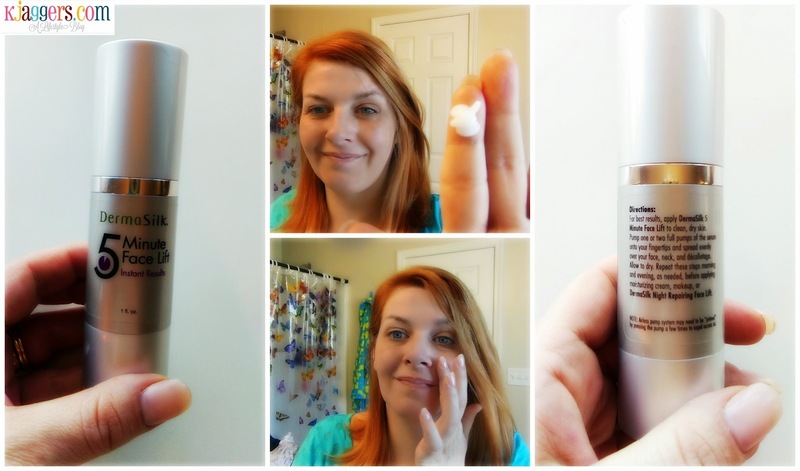 The next product I tested out was the DermaSilk 5 Minute Face Lift. I am moving right into my 40's and my skin and face is starting to change. I see more wrinkles, fine lines, crows feet, and even sagging skin. With the exception of major surgery, there is not much you can do expect try some new products to help. This 5 minute face life has an immediate flash effect. It gives your skin a lift that lasts up to 8 hours and improves your skin with continuous use. You just apply it with your fingers to clean dry skin. You can use it on your face, neck and on your chest area. I like to apply it to the back of my hands when I am done with the left over to help keep my hands looking younger. This product gives you instant results that you really do see. You can add your moisturizer or night cream right on top of it...and you don't need to wash it off first. I have used it mostly in the mornings but for maximum benefits you can use it morning and night. The final product they sent me to try out was the DermaSilk Flawless lotion/serum. This one is a bit different. The big claims with claims with this product is it will make your skin look 10 years younger in 40 seconds or less. It has no tint and erases the appearance of skin aging, lines, wrinkles, crows feet, sagginess and enlarged pores within seconds. This product was originally developed to help skin look better due to high definition motion pictures. HD shows everything and this cream was created so that the imperfections many of us have could be blurred on the camera. All my videos are HD and they show every little imperfection I have. I can totally relate! You can apply this in a few different ways. You can use it without makeup and apply it as the last step in your morning skin care routine. If you use a liquid foundation you can apply it after you put on your foundation. If you use a mineral or powder foundation, you should apply it first. Also if you have dry skin you can mix it with your normal moisturizer to apply it. There have been days when I have used it on its own just to help even out my skin when I am makeup free. Other days I have applied a small amount using my fingers over my foundation for a more air brushed effect. I was impressed again with how well this product worked for me. I have larger pores on my cheeks and love that it helps conceal that a little bit more without piling on tons of foundation, cover up or powder. All three of these products cost $20 each and you can find them at your local drug store. You can even find them at Walmart or on their website dermasilkbrands.com. I think that is a pretty good price for the results that they give. You should be eating healthy and drinking lots of water to help your skin stay youthful but products like these sure help too. None of the ones I tried irratertaed my skin or caused break outs. You have to be careful not to use too much because you can get a white flaky residue but just use a warm washcloth and pat the area to remove the excess. Besides that, these products have really helped my skin just as the DermaSilk Night Time Face Lift. I am rather impressed with all the DermaSilk products. I am actually thankful for the help! They are very easy to use..you need very little of each to get the desired effects and they improve your skin with continued use. DermaSilk is hosting a giveaway so one of you will be get one to try out all 3 products yourself! 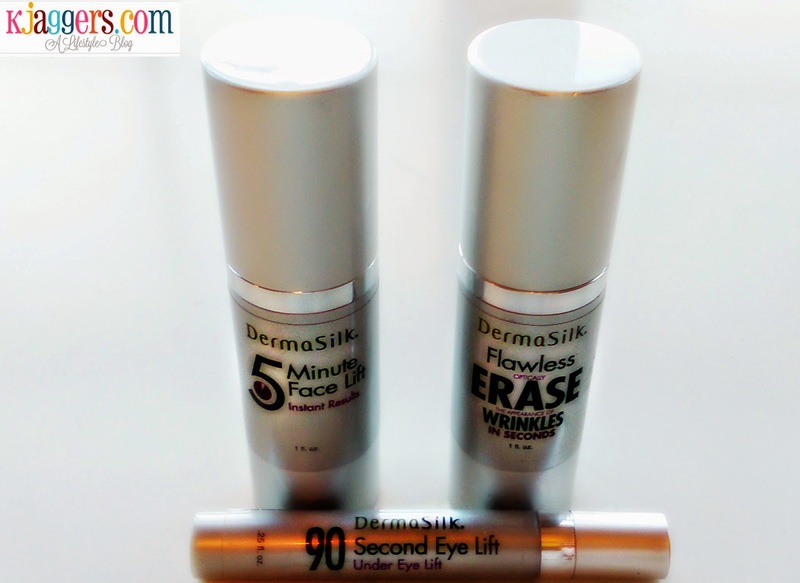 This DermaSilk Giveaway will run from today February 28, 2015 until Saturday March 7, 2015. The giveaway is open internationally. All entrants under the age of 18 must have parental permission to enter. The one winner will win The DermaSilk 90 Second Eye Lift, The DermaSilk 5 Minute Face Lift and the DermaSilk Flawless Erase.